Over 50 Organizational Tips for Kids’ Spaces! Okay, let’s just get right to it. These are kids’ spaces. Kids need and want to use their space for playing, right? They don’t want their precious floor space crowded with boxes of their own toys! But heaven forbid they actually have to give up any of those toys!!! So what’s a mom to do? First, I have to say that I’m a big fan of the “rotate” idea. I purchased three toy bins, two of them reside in the playroom. One of them stays in attic space, and the kids get to rotate toys in and out of it every 3 or 4 months or so. I find this helps my kids realize just how LITTLE they play with certain toys and helps them let go of them later on. If they can see that a toy hasn’t been “in play” for the last two or three rotations, it’s probably time for it to go to another home, so another child can enjoy it. That being said, the next thing moms are going to look for are space-saving and utilizing ideas. That’s what we’ll be looking for today! Enjoy the link below…. 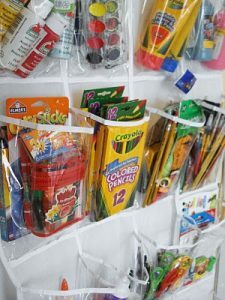 It shows all of the wonderful ideas for organizing, space-saving, and ideas for any kids room.